Barcelona president Josep Maria Bartomeu says the transfer ban handed to the Spanish club by Fifa is an "injustice". The Catalan club cannot buy players until the summer of 2015 after the world governing body found them guilty of repeatedly breaching transfer regulations in signing youth players. Barcelona have said they will appeal against the ban. "We're going to fight because we think this is an injustice," said Bartomeu. A Fifa investigation - centred on several players aged under 18 who were registered and played for the club between 2009 and 2013 - found that Barcelona and the Spanish Football Federation were guilty of a "serious" infringement of the rules in relation to 10 players. Bartomeu is adamant no Spanish regulations have been broken in signing young players to their La Masia academy and added that the club will not change their model for recruiting youth players. "It is not our intention to have to surrender the model of our youth system," he added. "The Masia system is not to be touched, that is something we want our members and fans to know. "We will fight against Fifa and this unjust attack on a model we have shown to be a huge success on a global level for over three decades." Bartomeu said Fifa's investigation into Barcelona came about from "an anonymous complaint" about "an unnamed player", adding that someone was attempting to "tarnish" the club's academy. "We are still studying certain documents and we will continue doing that until we can say which people, or who, is behind this," added Bartomeu. "We know we have to fight hard. We have had enough of this basically. Somebody out there is trying to tarnish the good name of our model. "It is hurting Barcelona. We have to show we have done nothing wrong. We have tried to be as transparent as possible, explain what has happened and let people know the truth and that the accusations are false." Prior to the ban, Barcelona had been linked with Borussia Monchengladbach goalkeeper Marc-Andre ter Stegen and Dinamo Zagreb attacking midfielder Alen Halilovic. 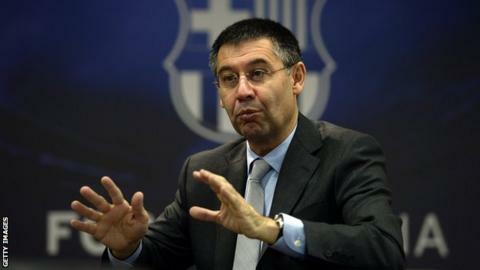 Bartomeu is confident the club's plans for their squad for next season will not be affected. "We have no intention of changing our plans at the moment," he said. "We have a season to get on with and at the right time we will be announcing new signings, who will at least be a goalkeeper and a centre-back."